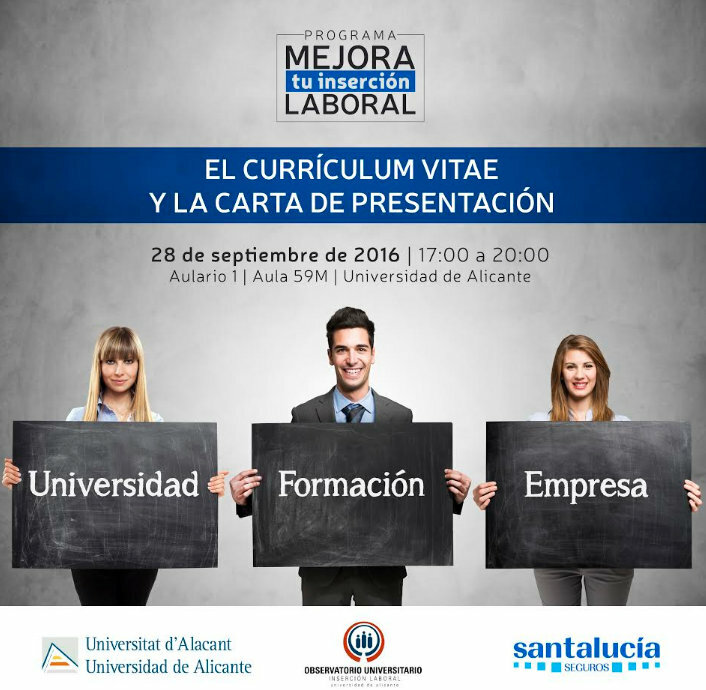 The next 28 September 2016, of 17:00 to 20:00 in the Aulario 1 - Classroom 59M, will llevar the session "The curriculum vitae and the letter of presentation", in the frame of the Program of Improvement of Insertion Laboral of the University of Alicante developed with the collaboration of Santalucía Safe. Your curriculum has to serve you to arrive to the interview, is your passport, and therefore has to be able to attract the attention of the one who looks for you and, besides, show that you are a/to true/to professional. We go to know the way to do arrive the message that want to transmit with your CV, and will see the way as you have to reflect it and do it arrive not to happen unobserved. The session will be given by Ana Román Aroca, diplomada in Labour Relations and Máster in Direction and Gestión of Human Resources by the University of Alicante. . With more than 11 years of experience in the area of Human Resources, at present occupies the position of Manager of Human Resources in the company Cleanings Córdoba.